Opening reception, discussion, and presentation of the various workshops, readings, and performances for the week. Question-and-answer. 90-minute Lesbian Tent Revival (“The Seven Deadly Sins and How To Bring More of Them Into Your Life”) with the Never-Before-Seen Superstition Mountain Revival Singers. “The Secret Life of Lesbians” Lecture and slide show. 2-hour rehearsal of actors for reading of a full-length Gage play: Recommended plays: The Goddess Tour (murder mystery) or Sappho in Love (comedy). “Beyond the L-Word,” a 2-hour acting workshop that includes elements of lesbian literature and lesbian herstory. Fun, user-friendly, beginners welcome... and open to folks who just want to come and watch! 2-hour Playwriting Workshop. This is a workshop for women interested in writing. 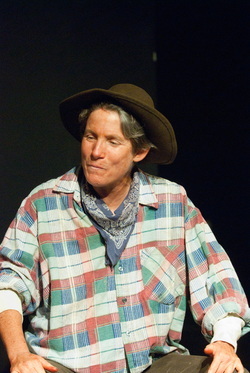 Gage will present a reading of her 15-minute play Calamity Jane Sends a Message to Her Daughter. Participants will learn the elements for creating a dramatically compelling monologue. The monologues will be read in front of the class at the end. Big welcome to folks who just want to watch! Reading of the play with discussion afterwards. Performance of The Parmachene Belle with talk-back.